Figure skating is still rising up to its full potential, with popularity and mass expansion still underway in comparison with other disciplines. Nonetheless, while betting is possible in few select establishments, the coverage figure skating events get is definitely massive. Considering the number of people scrutinizing the contestants on TV, online or in person, it is essential that both male and female figure skaters need to look utterly perfect. A major part of their outward appearance is contained in their attire, although the hair style and the choice of makeup could influence their impression just as well. Following are a few facts on the matter. These pieces of clothing are usually made by hand, both for the process of sewing and embellishment, which means that the more intricate it is – the longer it takes to make. Bear in mind that, while in the ring, figure skaters are not supposed to have any wardrobe malfunctions – should a crystal or a piece of fabric loosen up, the judges are known to deduct points. For this purpose, skaters often look long and hard before choosing their tailor. What is more, the costumes could be created by fashion designers, the likes of Cavalli and Vera Wang, which means their price tags are only rising with each additional detail. As troublesome as they seem, costumes worn by figure skaters are extremely comfortable due to the immense amount of spandex and lycra they’re made of. In certain situations, the fabric could even be silk, but it still needs to be comfortable and stretchy in order to allow all kinds of body movements. As of 2006, female figure skaters are no longer bound to wear skirts as the bottom part of their costume, which generally also includes a bodice. From that time, these skaters are just as free to wear pants, tights or entire jumpsuits, even though most figure skaters choose a skirt as their bottom, aiming to get some extra swing, sensuality and gentleness in their movements on the ice. What to do with the skates – show or cover them? 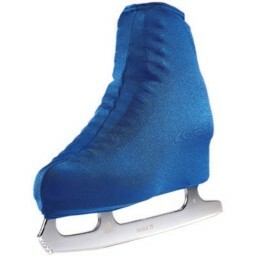 An indispensible part of each figure skater’s personal appearance is their skates, but whether or not they show them up front is their choice. Namely, both male and female skaters are known to be petite in physique and built, which is what has allowed them to practice the sport in the first place. However, in order to make their legs appear longer visually, many tend to cover their skates with the tights and achieve better fluidity. The decorations on the front of the costume aren’t always the only ones present, as some figure skaters express their religious beliefs or superstitions through charms. Many tailors and designers of such costumes have been asked to find a suitable spot and sew some charm or another for luck.